Theodore I was the first Emperor of Nicaea, the rump state founded by the aristocracy that fled after Constantinople was occupied during the Fourth Crusade. At first Theodore did not claim the imperial title, perhaps because there was no Patriarch of Constantinople to crown him Emperor. In addition, his own control over the Anatolian domains of the Byzantine Empire was challenged, by David Komnenos in Paphlagonia and Manuel Maurozomes in Phrygia. It was only after defeating the latter two in 1205 that he was proclaimed Emperor and invited Patriarch John X Kamateros to Nicaea. In 1214 Theodore concluded a peace treaty with the Latin Empire at Nymphaion, and in 1219 he married Marie de Courtenay, a niece of now deceased Emperor Henry and daughter of the current regent, Yolanda of Flanders. 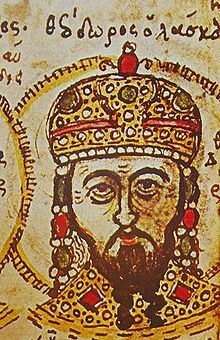 He died in 1221 and was succeeded by his son-in-law John III Doukas Vatatzes.